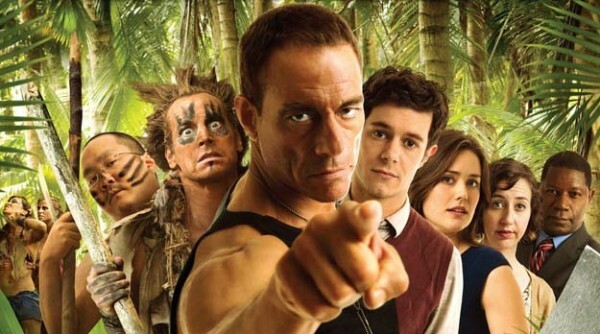 Welcome to the Jungle is an entirely likable comedy that once again illustrates the timeless truism that so long as he can stop being a pushover, the smart nerd always wins and gets the girl while the coarse, aggressive d**khead gets his face righteously kicked by Jean-Claude Van Damme. Welcome to the Jungle is the first foray into comedy by one of my favorite dudes, Jean-Claude Van Damme. It’s basically a comic reworking of Lord of the Flies, complete with a Ralph archetype and a Jack archetype. Throw in a pinch of Survivor, a dash of Office Space, a nod to Apocalypse Now and a deft comic ensemble cast and you’ve got a buttload of fun. The Ralph archetype is Chris (Adam Brody), one of those Nice Guy Losers whose heart is in the right place but to whom everything bad just keeps happening, partly because he lets it. The Jack archetype is Phil (Rob Huebel), who steals one of Chris’ creative ideas and claims it as his own at the ad agency they work at just before the two, along with the rest of their co-workers, are shuttled off to a mandatory “leadership training” camp on a remote tropical island led by—who else?—the master of Epic Splits (and, no, he doesn’t do the splits in this movie). Once on the island, things quickly descend into Lord of the Flies territory with former Eagle Scout Chris being the voice of reason and Phil embracing this chance to more fully bring out his already savage, pseudo-Alpha Male nature. Being an all-out, raunchy comedy, it would be hard for Jungle to convincingly depict a believable slide into primitive behavior, so it smartly doesn’t try. Instead it uses an easy plot device to explain why all of a sudden people start acting like, well, the kids from Lord of the Flies. Raunchy, farcical comedy that this is, don’t expect any William Golding-esque meditations on the dualistic nature of man. This is just pure guilty pleasure. And pleasurable it is, mostly due to some fine work by the ensemble cast, especially Kristen Schaal, Dennis Haysbert and Eric Edelstein as a Seth Rogen-type buddy character. My main man JCVD is also used to some great comedic effect, delivering what I do believe is the funniest line of his career. So long as the scripts are good—and this one, for a small scale Hollywood comedy, is pretty good—I hope to see him explore this genre a bit more as Arnold Schwarzenegger did with the Ivan Reitman comedies of the late 80s-early 90s. Speaking of the cast, though, I do have to slip in one minor qualm here. Now, my peers know that I’m one who rarely sounds the racism alarm. In fact, I often defend works that others accuse of being racist. But come on, guys, it’s 2014. Are we still casting the Asian guy as the effete, subservient sissy? That is so yesterday. Add then add in the blubbering, barely comprehensible Latino guy and I’m afraid I’m going to have to call the filmmakers out on this one. Fortunately, I am one who doesn’t let this kinda thing get in the way of a movie that I’m otherwise enjoying. And I did enjoy this movie. It’s just my duty as a reviewer to be honest and balanced. Other than that, Welcome to the Jungle is an entirely likable and serviceable absurdist comedy that once again illustrates the timesless truism that so long as he can just stop being a pushover, the smart, nerdy guy always wins and gets the girl while the coarse, aggressive d**khead gets his face righteously kicked by Jean-Claude Van Damme.